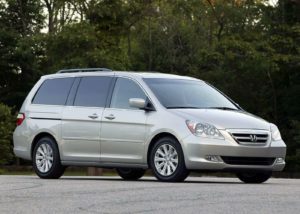 Home Car/Bike Reviews Are minivans the modern everyman vehicle? Minivans are not exactly at the top of people’s bucket lists. For many, they signal an end to driving pleasure, and an acknowledgement that tasks such as carrying groceries, taking the kids to hockey practice and schlepping supplies around now take precedence over random drives in the country with the top down and tearing it up through the corners. You don’t buy a minivan because you want one, you buy it because that’s what you need. Today’s breed of these people-movers can be fast, comfortable, powerful and, sometimes, more than competent when it comes to handling and braking. Not in the same league as a sports car, agreed, but they can make an excellent long-distance tourer, with above-average highway road manners and a comfort level – depending upon the trim level – that can rival an upscale sedan. The 2005 Honda Odyssey has a smooth ride and good fuel efficiency, but has brake wear and transmission issues. • With 255 horsepower on tap, the 3.5-litre V6 propelling this generation of the Odyssey is arguably the smoothest, most refined and predictable on the market. It also featured an optional variable cylinder management system on some models, making it the most fuel-efficient for this year: 12.3 and 8.6 litres/100 km. • Interior storage volume of 4,173 litres gave it one of the roomiest interiors in this segment. • Stability control became standard equipment. This aids considerably when it comes to ensuring the vehicle stays planted and doesn’t skid out of control. Important when carrying loads/people. • Above-average highway manners with surprisingly good handling/braking. • Thoughtful interior amenities such as a lazy susan storage compartment under the rear floor. • A high drivability factor. • Third row seats that fold easily into the floor. • Comparatively high residual value. Good news if you’re a seller, not so good if you’re a buyer. • Finicky rear hatchback struts and problematic power side doors. This latter issue is common with all minivans, but particularly acute with the Odyssey. The higher the mileage, the worse it gets. 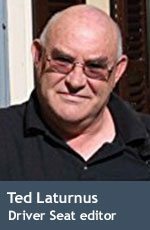 • Premature brake wear and transmission issues. Two common complaints. • Centre row seats that must be manually removed to open up the inside for storage. They’re heavy and awkward. 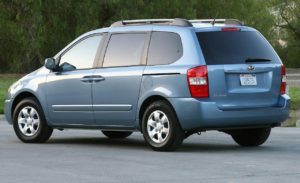 The 2008 Kia Sedona offers good value for the money, plenty of storage and comfortable seats. But it has electrical and drivetrain issues. • Good value for money. 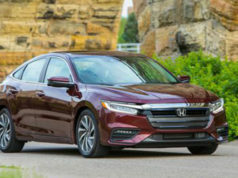 Despite being three years newer than the aforementioned Odyssey, it’s actually less expensive and features essentially the same amenities and comfort level. • Above-average front seats with built-in armrests – comfortable over the long haul. • Storage nooks and crannies galore, including two glove boxes and a nifty foldaway centre storage tray. • Optional power adjustable pedals. • Unusually low NVH (noise, vibration, harshness). This is one of the quieter minivans on the market, with minimal highway/ wind noise. • Inordinately high number of electrical and drivetrain glitches. Consumer Reports, for example, gives it one of their worst possible used car predictions. • Again with the wonky power side doors, especially if you use the keyless remote. Advice: buy one with manual side doors. • Still a little on the thirsty side: 13.2 and 8.8 litres/100 km. • Centre row seats come out easily but are heavy to manhandle. • Relatively poor resale value. This one dropped precipitously in value almost from the day it was introduced. 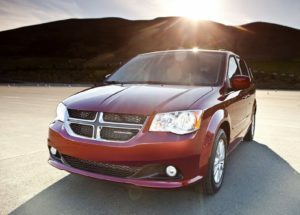 The 2011 Dodge Grand Caravan offers all you really need in a mini-van, but reliability questions linger and the transmission has caused problems. • A new 383 horsepower, 3.6-litre V6 engine, six-speed automatic transmission and revised suspension finally enabled it to keep up with its rivals. • The slick Stow and Go centre seats that disappear into the floor are a huge plus. Opening up the interior for big loads was never easier. 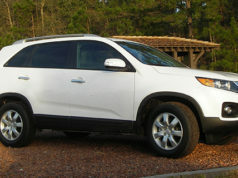 • Good value for money, especially the Canada Value package, which offered all you really need in a minivan. • Relocated shift lever to the centre dash more user-friendly than the previous steering column arrangement. • Comparatively better fuel economy: 12.2 and 7.9 litres/100 km. • More interior cargo capacity than before – 4,071 litres – and you can get a tradesman’s version. • Questions about Chrysler reliability linger. The U.S. National Highway and Traffic Safety Administration, for example, has over 40 complaints officially registered against this vintage of the Grand Caravan and Consumer Reports gives it its lowest used car prediction – all this barely three years into its run. • Transmission problems continue to plague this model. • Predictably poor resale value. 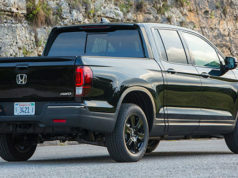 With an under-$20,000 base price when new, three-year-old models lose their appeal, especially if they’re getting close to the end of their warranty. • Still less cargo capacity than the Odyssey.